The main reason Hans Christian Andersen became a literary genius was that, as he explained in his autobiography, he remained a child all his life. Andersen, the father of the literary fairy tale, is Denmark’s greatest author. While known mostly for children’s stories, he was a prolific travel writer, novelist, poet and playwright. He even invented his own visual art form—paper cuts. He had good reasons for getting “stuck” in childhood. His beloved father died when he was 11. His mother was an alcoholic. His half-sister was probably a prostitute. He left home at 14 and supported himself from then on. In a new biography, out to mark Andersen’s 200th birthday, he is “revealed a man who was self-centered, vain and emotionally needy,” writes a reviewer. Yet a “childlike wonder and innocence” blossomed through his inner turmoil. 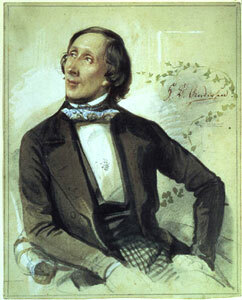 A few years after his father died, at age 14, Andersen struck out for Copenhagen to try to get into the theater. No one would hire him as an actor, dancer or singer. But when someone along the way casually referred to him as a poet, he had an epiphany. A theater director took Andersen under his wing, arranged for him to go to school, and ultimately helped him get into the University of Copenhagen. A year after entering the university, at age 24, he published a poem. He followed it with a musical drama that was produced by the Danish Royal Theater. At 30, he published a novel, “The Improvisatore.” Like many of his works, it was biographical, describing a poor boy’s integration into society. The book was an international smash hit and became the most widely read Andersen work throughout his lifetime. Beginning when he was about 26 years old, he became the 19th Century equivalent of a jet setter. During his lifetime, he took 29 trips outside Denmark to Germany, France, Sweden, Spain, Portugal, Italy, the Middle East, Asia and Africa. Travelogues became one of his important writing forms. As a boy, Andersen was tall, awkward and unattractive, and was teased for being effeminate. Those experiences might have undermined his confidence in his masculinity and contributed to his remaining a bachelor. Nonetheless, he fell in love twice. The first time was in his 20s. The woman, Riborg Voigt, married somebody else. Andersen wrote to a friend, “I do wish that I were dead.” When he died at 70, he had a leather pouch around his neck containing one of her letters. In 1935, after his novel took off, he started writing the fairy tales that would make him famous forever. In the tradition of serials such as The Arabian Nights, he wrote a new volume almost every year up to 1872. Many of the books were issued at Christmastime. Through characters like ducklings and mermaids, he expressed his personal dilemmas. “The Ugly Duckling” that turned into a swan symbolized his own evolution from a gangly, impoverished boy to an author who was the toast of Europe. In “The Little Mermaid,” the mermaid’s discomfort at leaving land for the sea was possibly a metaphor for his leaving Odense, not sure if he would be accepted in Copenhagen. As if being a great writer of all types of literary works wasn’t enough, his paper cuts showed another dimension of his artistic genius. As he recited tales to an audience, he often took a piece of paper, folded it a few times, and with gigantic scissors, cut out elaborate scenes and expressive figures. Typically, a paper cut represented a different tale that the one he had just recited. An essayist, Horace Scudder, writing in Harper’s a few years after Andersen’s death, summed up his unique contribution to literature. The ability to endow inanimate objects with life and personality, he writes, is strongest in childhood. “It is very apt to die out or become indistinct in later years. Andersen never lot this power; he cultivated it….He was the interpreter to the world of that creative power which is significant of childhood; the child spoke through him.